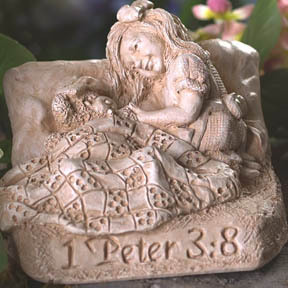 Inspirational Christian gifts- God’s Word Collectibles. 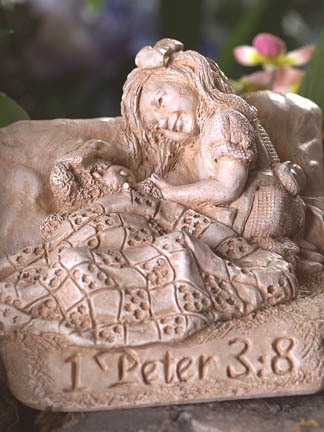 1 Peter 3:8 "Be sympathetic and compassionate"
Home > God's Word Sculptures > 1 Peter 3:8 "Be sympathetic and compassionate"
The card outside, inside is blank. The sculpture 1 Peter 3:8 came about a bit differently than the rest in God’s Word so far. I knew what I wanted to sculpt. I knew the meaning of the piece, but I had to search for the scripture. So this scripture is now added to my list of favorites. I sometimes wonder why sculptures come out in the order that they do. Some sit inside of me, ripening for a long time, others are just there. Be compassionate, sympathetic, humble, love... I can say that I have experienced the wonderful compassionate nature of God through others. I have had trials and tribulations in my life. I thank God for them because they have helped me to grow and become the person that I am. But if there was no other reason to have trials and tribulations but to experience the incredible sweetness of compassion, caring, and love in a time of need, it would be worth it. To have the experience of seeing God’s love for me through the actions of others is nothing less than awesome. I am sure this piece is also inspired by my most recent experiences with my mother’s illness. With her on her death bed, the doctors and my siblings sent for me. I rushed to her side to say goodbye, yet miraculously with mercy and grace God healed her. Her testimony is incredible, but what also is so profound to me is to watch those that rallied at her bedside, that lifted her in prayer, took care of daily things, and nursed her spirit into health. Like the friends in Mark 2:3-5 who carried the bed of an ill friend through the crowd, tearing up the roof and lowering him down in hopes that Jesus would heal him, these caring siblings, in the Lord, were strong, carrying my mother’s burden when she could not. selfless, caring spirit, may the Lord return that unto you again and again. Thank You so much for this giving person. Their love will be felt in our hearts for a very long time. Please bless them in return. In your “Daddy” like way, let them know just how proud You are to call them sons and daughters.